« Do Pathogens Time Travel? But turn-around, however petty, can also be unfair play. Marx was more than willing to kick out those about him he thought unsuitable for his smaller kingdom. As Francis Wheen describes it in a sympathetic biography, Marx and partner-in-crime Fredrich Engels would interrogate prospectives for the Communist League in a London drawing room. After subjecting each poor probationary to a battery of questions—imagine those orals—Marx would inspect the interviewee’s head for its shape and bumps. The resident Communist phrenologist would next be invited in to complete the examination. But that isn’t the twist that raises this eyebrow. There’s instead Wheen’s passing tidbit that the Prussian diplomat who delivered King Friedrich’s letter to the French court was none other than Alexander von Humboldt. The francophile father of modern biogeography, who inspired generations of researchers, Charles Darwin included, helped eject one of history’s premier social scientists. I can think of no better parable for the current state of much of modern biogeography. 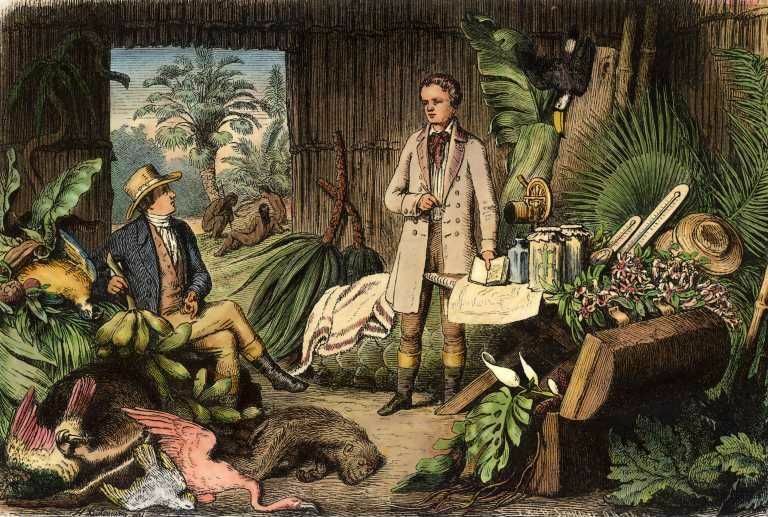 Upon laying claim to his inheritance at 30, Berlin-born Alexander von Humboldt (1769-1859) set out for what would be a stunning five-year journey across Latin America with the fortuitously named Aimé Bonpland, whom Humboldt had met in Paris. The journey was sanctioned by the Spanish government as one of several attempts at learning more about its vast American holdings both physical—Humboldt was once a mining inspector—and human—colonial elites increasingly chafed under the metropole’s directives. It was an intricate social fabric and a critical historical juncture into which Alexander von Humboldt and Aimé Bonpland set foot when they arrived in South America in 1799. For the five eventful years that followed, they participated in the moment as they made their way around what they liked to call the New Continent. Their historic journey, and the monument of print it produced, laid down the lines for the ideological reinvention of South America that took place on both sides of the Atlantic during the momentous first decades of the nineteenth century. For thirty years, while popular uprisings, foreign invasions, and wars of independence convulsed Spanish America, Alexander von Humboldt’s vast writings on his equinoctial travels flowed in a steady stream from Paris, reaching thirty volumes in as many years. Given the continent’s backdrop, what America did Humboldt see? In the Old World the nuances and differences between nations form the main focus of the picture. In the New World, man and his productions disappear, so to speak, in the midst of a wild and outsize nature. In the New World the human race has been preserved by a few scarcely civilized tribes, or by the uniform customs and institutions transplanted on to foreign shores by European colonists. In contrast with strictly scientific writing, the authority of the discourse here plainly does not lie in a totalizing descriptive project that lives outside the text. Here, the totalizing project lives in the text, orchestrated by the infinitely expansive mind and soul of the speaker. What is shared with scientific travel writing, however, is the erasure of the human. The description just quoted presents a landscape imbued with social fantasies–of harmony, industry, liberty, unalienated joie de vivre–all projected onto the non-human world. Traces of human history, unidentified, are there: the horse and oxen arrived through a force no less occult than the invading Spanish. But the human inhabitants of the Llanos are absent. The only “person” mentioned in these “melancholy and sacred solitudes” is the hypothetical and invisible European traveler himself. Somewhere in the background of the painting of Humboldt and Bonpland reproduced above (and better seen here) are a few unidentifiable natives, only one of the copious taxa arranged across the diorama. There are no ‘natural’ systems. There remains no place on Earth’s surface and no organism untouched by humanity in one way or another. Global warming, urbanization, agriculture, stockbreeding, overhunting and depleted fisheries, pollution, herbicides, antimircobials, and geo-engineering intentional and inadvertent have together changed Earth forever. If humans were all removed tomorrow, our short tenure would still set biology’s subsequent trajectory. Even the smallest taxa are affected. While many microscopic pathogens clearly have origins before humanity’s emergence and continue to manifest their own agency, all have since been entrained directly or indirectly into the anthrosphere. Worse, many physical geographers and population biologists appear hobbled by prelapsarian fantasies about the systems they study, which are often underpinned by hopes that humanity’s environmental destruction can be reversed and nature can rebound to some previous or related state. Their biophilia orbits about an ache for a return to Eden’s warm womb, wherein human populations, folded double back into civilization’s fetal position, would act as only one of an organismal assembly with access to Earth’s commons. The resulting work is freighted with a concomitant distaste for any interdisciplinarity beyond the natural sciences (outside perhaps the lip service the granting agencies like these days). It’s a provinciality that is starting to be eaten away at by gruesome realities on the ground but remains shockingly prevalent, locking down academic jobs and grants alike. The self-indulgent myopia, losing the deforestation PACs for the tree rings, explains in part why we lost on climate change. Long-term atmospheric data and shifting home ranges were mistaken as enough of an argument in the face of industrial lobbies that owned policymakers lock, stock and barrel across political parties. And yet, even that characterization may offer too much credit. This particular brand of empiricism is itself a function of the imperial designs that threaten the biosphere its practitioners claim they aim to protect. In other words, the Eden Ache is but another in capitalism’s arsenal of illusions, this one allowing first-world environmentalists to run roughshod over objections to neoliberal development, all in Earth’s name. The International Union for Conservation of Nature, initially convened by the UN, accepted money from, and defended efforts by, developers interested in building along India’s coastline, one of only three places in the world where the olive ridley sea turtle beaches to lay eggs. The Netherlands’ African Parks Foundation attempted to lease and manage the Omo and Nech Sar National Parks in Ethiopia. The Foundation’s plans for Omo included evicting local tribes—the Suri, Dizi, Me’en, Nyangatom, Kwegu, Bodi, and Mursi—from their ancestral land or blocking access to traditional agriculture and grazing. The Foundation was beaten back and gave up its lease. Gore has responded he’s put his money where his mouth is, which is, for those of us who do indeed believe climate change real, a damning admission. Gore, profiteer, misrepresents the economics that have brought humanity near destruction as the means of its salvation. The failures of judgment extend beyond blatant corruptions personal or political. Most scientists, after all, try their best to play by the rules, something of its own problem. Some, indeed, suffer a socially selected inattentional blindness that allows them their good works, however incomplete, as long as the resulting research avoids challenging the prime directives of power: capitalism is right; inequities are natural; despoliation is just, not a big deal, accidental, or caused by those exploited; and war—when waged by the rich—peace. The thinking goes that if I can avoid mentioning power’s precepts, and so eschew addressing the world’s political order (and, ergo, its problems), I will be allowed the environmental fight, a clear conscience, my funds and affiliations, and the right to pretend honesty to my children at home and my grad students at work. Logistically, I can still draw tenure while remaining hermetically sealed from my colleagues in the human disciplines however often I show up to the department’s coffee hour. Despite the emphasis on primal nature, in all their explorations, Humboldt and Bonpland never once stepped beyond the boundaries of the Spanish colonial infrastructure–they couldn’t, for they relied entirely on the networks of villages, missions, outposts, haciendas, roadways, and colonial labor systems to sustain themselves and their project, for food, shelter, and the labor pool to guide them and transport their immense equipage. Even the canonical images of interior plains, snow-capped mountains, and dense jungles did not lie outside the history of humankind, or even the history of Euroimperialism. The inhabitants of the Venezuelan llanos and the Argentine pampas, however removed from colonial center, were about to be recruited as soldiers in the wars of independence. The jungle had been penetrated by the colonial mission system, whose influence extended far beyond the mircocosmic social orders of its outposts. As we will learn in the posts to follow, this kind of structural maculopathy hampers the study of pathogens. Our difficulties in seeing the bugs stem from more than their microscopic size. This entry was posted on January 21, 2010 at 7:36 pm and is filed under Evolution with tags Al Gore, Alexander von Humboldt, biogeography, Marx, Mary Louise Pratt, pathogens. You can follow any responses to this entry through the RSS 2.0 feed. You can leave a response, or trackback from your own site.